"For me, I just want to be part of a successful team this year, to be happy and to play in and win many games as I can with my new team. "I can't wait to step out in the Bronx on a gameday and to meet the fans for the first time." NYCFC Head Coach Patrick Vieira believes that the addition of Ebenezer will help to raise the level of every player at NYCFC, especially in the middle third. "I'm really excited to bring in Ebenezer - he's a young player who is looking to improve, he is really dynamic and can cover ground," said Vieira. "He's really aggressive but he's good with the ball too. I'm really pleased that we managed to bring him to the football club. NYCFC Sporting Director Claudio Reyna feels that Ofori's competitive spirit and quality will add plenty to a strong NYCFC midfield. "Ebenezer plays as a holding midfielder that can help dictate the tempo of the game with his quality passing ability," said Reyna. "He has good technique combined with a very good game understanding that will provide another element to our team. "We are very happy to add him to our strong midfield unit and look forward to seeing him grow as a player at NYCFC." A 22-year old midfielder, Ofori joins from Bundesliga outfit VfB Stuttgart where helped Die Roten win promotion to the top division with nine appearances in the first half of 2017. Before that, Ebenezer spent three successful seasons at AIK in the Swedish Allsvenskan, appearing on more than 75 occasions, scoring four goals and earning the league award for Best Midfielder in 2015. To date, Ofori has earned eight senior international caps with Ghana since making his debut in February 2017. He scored his first international goal in an African Cup of Nations qualifier vs. Ethiopia. Starting out his career at New Edubiase United FC in his native Ghana, Ebenezer made his name in his breakthrough season in 2012/13, playing 17 games and scoring four goals. 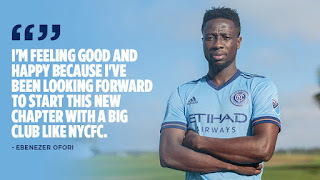 Ofori becomes NYCFC's eighth addition of the offseason, following Saad Abdul-Salaam, Jo Inge Berget, Cedric Hountondji, Jesus Medina, Brad Stuver, Ismael Tajouri-Shradi and Anton Tinnerholm. Thanks for the auspicious writeup.The next occasion I read a weblog, Lets hope so it doesnt disappoint me as much as this.